-A yummy dinner of steak, potatoes and grilled zucchini with tomatoes. Can you tell I'm trying to fill up on traditional Texas fare before going to Belfast? 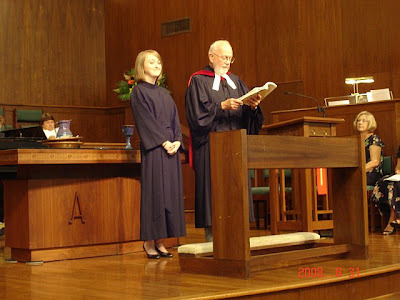 -Being ordained as a PCUSA Minister of Word and Sacrament. The service was perfect, from Kyle's Lord of the Rings themed sermon, to Bob Leslie (the pastor who baptized me in that very church) holding my hand to pronounce that I was ordained and having to stop because he was overwhelmed with emotion, and then choking out "I used to hold her" before continuing, to hands layed upon me in blessing, including my parents and Grandmother, to Marie charging me to be guided by my inner joy and the constant presence of God to so many more things. It's difficult to convey in words the peace and tangible hand of God felt in this day. -Being with so many wonderful friends and family. It was so great and suprising to see friends like Heather, Stuart and Allison who I haven't seen in years. 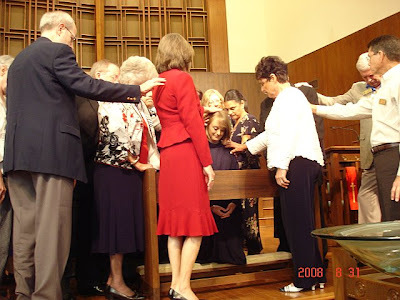 In one room, I had pastors who have guided and supported me, a great deal of caring family, old college friends, a friend from elementary school and dozens of people who took very seriously their promise made to me and God at my baptism there. 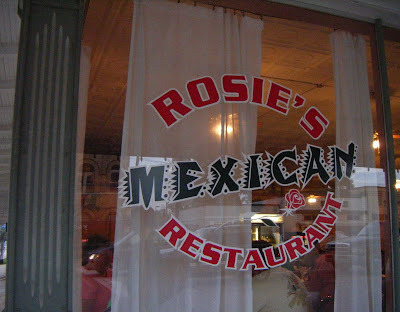 -Eating delicious Mexican food--the best I've had in a long time. I loved the overcrowded restaurant packed with football fans ready for the first game of the season, chattering to each other and laughing. I glanced up and made accidental eye contact with one of the cooks from behind the window to the kitchen. We both smiled briefly and then he went back to cooking and I went back to devouring his fantastic spicy enchiladas. -A Friday night spent curled up on the couch reading Lord of the Rings, and getting completely engrossed in that magical, whimsical tale once again. -The first melodious notes of the opening song on my Out of Africa record. -The man next to me at the deli counter of the grocery store who ordered a half-pound of "the most rare roast beef you have." The woman at the counter made a face and then smiled, saying she wasn't a fan of rare meat. The man turned to me and explained, "My Grandfather taught me to like rare meat a long time ago." 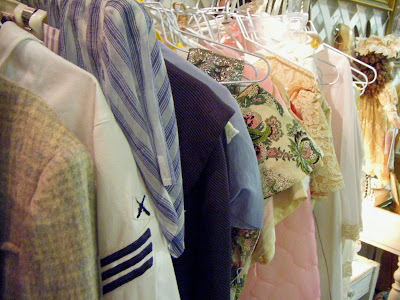 -Going antique shopping with my Mom and enjoying all of the varied odds and ends, like old hats, jewelry, furniture and clothing. I love that each thing has a story and a history behind it. 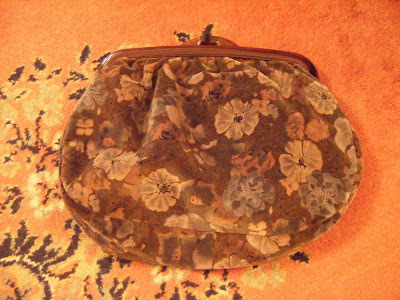 I ended up buying a gorgeous carpetbag clutch (for only $3! ), and I love it. 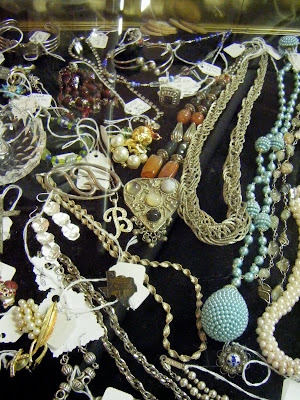 You know how I love antique bags. -Cooking ribbolita (an Italian soup) and savoring the flavors of creamy white beans, salty pancetta, earthy herbs de Provence and tangy parmigiano reggiano cheese. 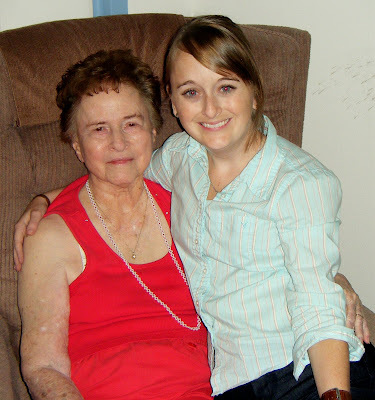 -Spending time with my Nana and Grandmother. Sitting on the carpet in my Nana's house playing solitare and listening to the conversation while the rain poured outside was such a familiar, comfortable way to spend the afternoon. 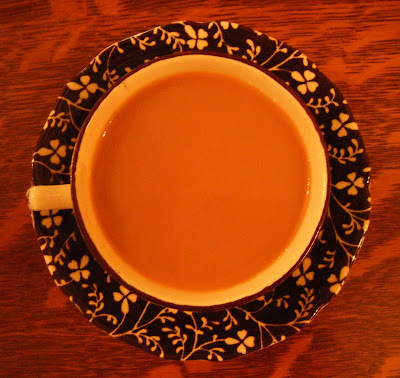 I also enjoyed being curled up on my Grandmother's couch with a hot cup of coffee to warm me up after being drenched in the aforementioned rain. -Little yellow veins in a bright colored leaf that, when looked at sideways, looked like a line of thin, winter trees. -The feel of the peach-hued early evening sun on my back. 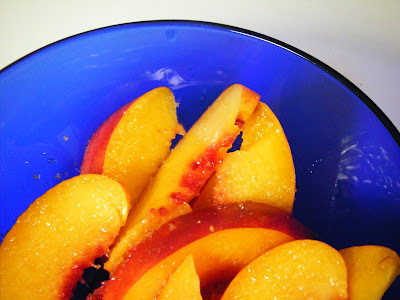 -Delicious sliced nectarines drizzled with tangy lemon juice and crunchy turbinado sugar. -Reading James Joyce and bike riding. Let me explain: this might sound bizarre, but I often have very vivid dreams, and while they don't necessarily tell me what I should do, they do sometimes give me great ideas. I don't know if it's a reflection of my own desires or from God, but the other night when I was feeling anxious about moving to Ireland, I had a dream in which I was told to read James Joyce books to feed my imagination about Ireland and to ride a bike more often because that will be my primary means of transportation there. Well yesterday, I did both, and felt a little proud at making my dreams come true. -Sitting outside just to listen to the birds, feel the breeze and think. -Attending presbytery to preach and be examined for ordination. I was a little nervous, but having my parents, sister and niece there helped a lot, as did having members of my CPM (Committee on Preparation for Ministry) there to encourage me. Two women from my CPM were especially kind, and told me they were excited about me returning to Ireland and my call. It was comforting to have one of them sit by me to tell me how much this blog meant to her right before I went up to preach. -Lying in bed last night and trying to wrap my head around my being finished with the ordination process (other than my ordination service next Sunday). It has been such a long and demanding process and I can't believe I'm done. Needless to say, I slept beautifully. 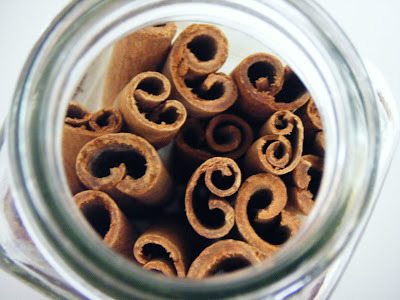 -Grating fresh cinnamon into my coffee. "This little box is just another piece of equipment for the journey--and I know that journey is taking you to where your heart has been for a while." 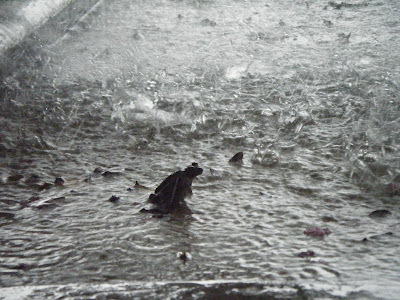 -Watching a tiny frog jump bravely through a torrent of rain and letting the raindrops splash on my toes. -The teenage girl working at Target who helped me find some old boxes that I could use to ship things to Belfast. She was so helpful and took her time carefully sorting through and picking good boxes. 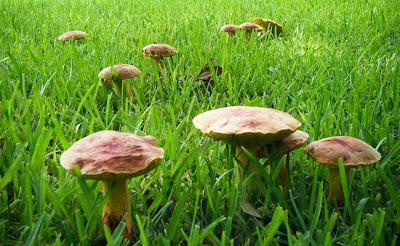 -The torrent of rain caused an entire family of mushrooms to sprout up. These are red on top with yellow stems, and range in size from a quarter to a softball. I half expect David the Gnome to inhabit them soon! -Passing my Dad as I drove away to run some errands. We both stopped in the middle of the street for a good five minutes to catch up and chat through our open windows. It's nice to live on such a quiet street that this causes no disruption at all. -Receiving a lovely green fair-trade scarf from my wonderful friend Karen. She sent a note (addressed to: "Missionary Extraordinare" with "Ireland or Bust!" under it) and explained that the greens in the scarf reminded her of Irish green hills and that she knew I would appreciate it being fair-trade. It was a very thoughtful gift. -Getting new glasses that are quirky and classy at the same time. I went much bolder than my last pair, and I'm so glad I did. I love the chocolate brown molded plastic frames with an orange interior. -Helping with my niece's baptism by preaching and leading prayers and blessings. 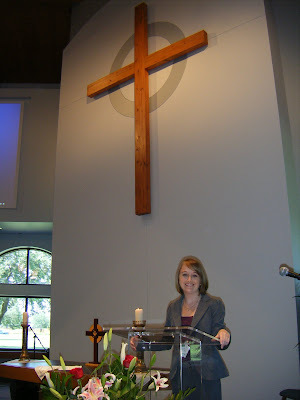 I was the first woman to preach at the church and was so honored. The deacon leading the service (it's a Catholic church) was really casual and friendly and made me feel welcome and comfortable. He would start reading a liturgy, pause, and then hand me his book to continue it. It was a great time with all of the family. -Seeing my friend Jen again. We were roomates in Belfast, and I haven't seen her in over a year, so I flew to Tulsa for a quick reunion. It was so fun to fit into familiar patterns of conversation after such a long time. 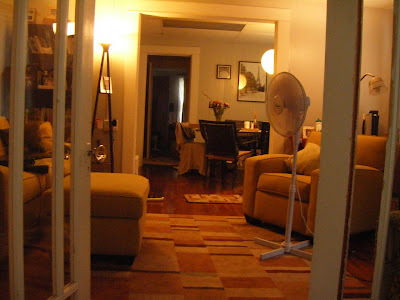 I loved her place--with pictures from around the world, fresh flowers, a sunroom with french doors (in which I stayed), old wooden floors and a tiny red kitchen--it was just as vintage, quirky and traveled as she is. -Escaping from the rain into a sort of bohemian wine bar heaven. 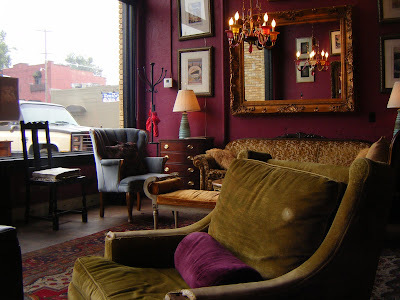 Jen and I chatted over our $4 house reds and relaxed comfortably into the worn velvety furniture, with the sounds of The Godfather being broadcast from a t.v. in the back. 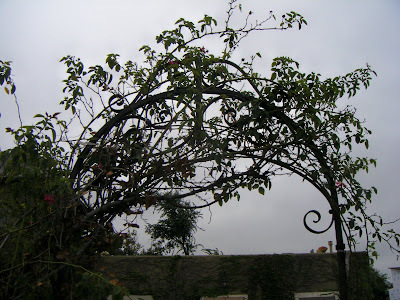 -A swirly wrought-iron arch intertwined with dark green leaves. -Hanging out with my precious niece and seeing her really respond to me with smiles and giggles. -Sitting on the beach and soaking up the Texas sun while reading The Dubliners by James Joyce. It made the descriptions of a cold, rainy Grafton Street feel so far away, and yet close by in my memory. -A weekend at Port Aransas with my family spent relaxing on the beach, watching the Olympics and cheering, laughing and telling corny jokes and eating delicious seafood. With my flight to Belfast only 3 weeks away, these times are very precious. 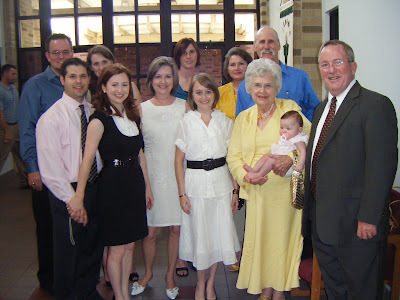 I'm going out of town tomorrow to preach at my niece's baptism (in a Catholic church...so fantastic!) and then I'm off to Tulsa to catch up with my great friend Jen, then I'm in Houston hanging out with my sister, brother-in-law, and freshly-baptized niece and then off to the beach next weekend to soak up some Texas sun one last time before I go to Belfast. 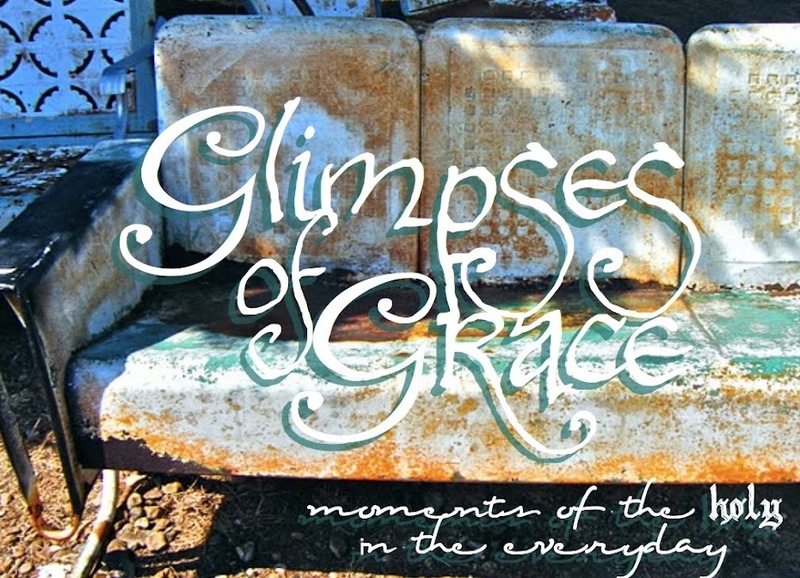 I'll be sure to share many glimpses of grace when I return! If you like, comment some of your glimpses to share here while I'm away. I know they would be enjoyed. -Booking my flight(s) to Belfast. It feels fantastic for it to actually be happening. -Going solo to see a movie. Sure, I can move to a foreign country, but going to a movie alone in my hometown? Now that scares me. It really was great fun, though. 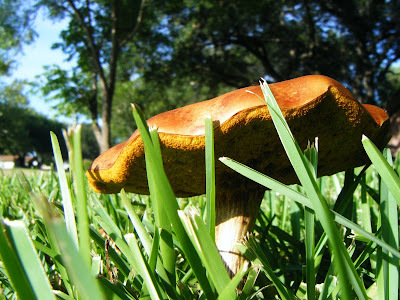 -A huge brownish-orange mushroom growing boldly out of the green grass. 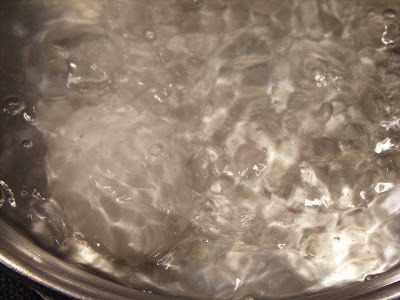 -Shiny bubbles of water boiling the egg I cooked for breakfast. -Enjoying my tea outside in the morning right before it got hot and steamy outside. I could literally feel the moment the heat came, and luckily I had just finished my last sip and was ready to go inside anyway. -Finishing a sermon for my niece's baptism on Sunday. -The swoosh and plunk of raw sugar being dropped into my tea. Yum. -Dancing around to Abba on my iPod. I'm a bit obsessed with the music from Mamma Mia at the minute. -Sudden heavy rain followed by brilliant sunshine. Texas seems to have no patience at all for rain, geting it over with as quickly as possible, and immediately bringing the sun back out again. Half the time, the sun doesn't even have a chance to go away at all. 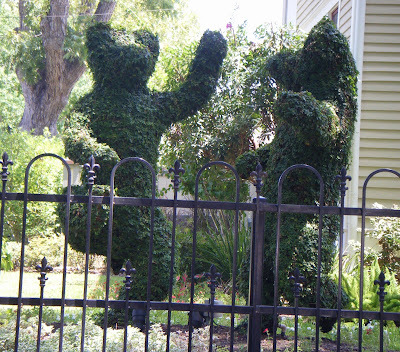 -Dancing bears carved out of shrubbery in someone's yard. They were so whimsical, bizarre, and yet, right at home, that I laughed and circled the block for another look. 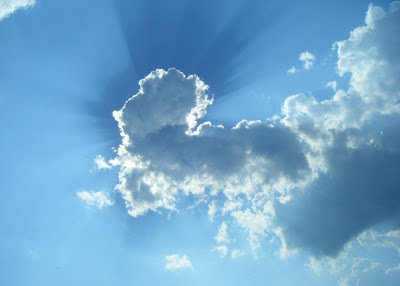 -Bright streams of sunlight stretching out like fingers from behind fluffy clouds. -Finishing a good book (and being able to laugh at the overly-cheesy ending). -Leading worship at my home church and feeling so welcomed and valued. One woman came up to me and said, "I'm so excited for you. You've arrived!." I'm not entirely sure what that meant, but I know that, whatever it is, I want to "arrive." -A nice long lunch with my good friend Kyle. I love those conversations that just last for hours and feel like ten minutes. -Seeing a woman come in the coffee shop, sneak in behind a man sitting alone at a table, and give him a kiss on the cheek as a greeting. They both smiled and she sat down. -The first glimpse of the aquamarine ocean through the grass as we drove to Rockport for some authentic seafood. 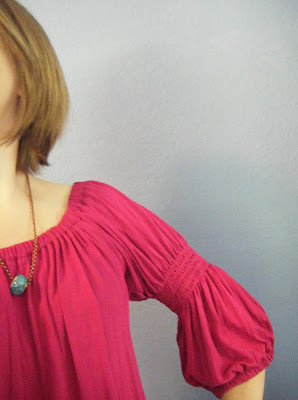 -A lovely bright pink bohemian blouse, which is soft and flowy and gathers in all the right places. I usually avoid pink, but this magenta shade was so bright and fun. -Stopping at quite possibly the most quirky coffee shop I've ever been in (and that's saying a lot). 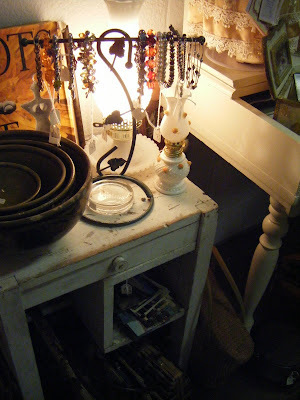 The place was cozy and beachy, with wicker chairs everywhere, hand-painted walls and puffy sofas. The woman working at the counter greeted us with her bubbly personality and purpley-penciled eyebrows and charged us for basic drinks and then told us to head to the barista ("who is FANTASTIC") at the bar and "have fun, go crazy" with flavors. There was a live guitarist filling the place with impromptu music, and the barista was great. I got caught up in all the fun and added coconut flavoring to my frozen mocha drink, and it was fantastic. The barista, Adriana, also brought me what was left in the blender from making my drink in a little glass. What a delightful place. 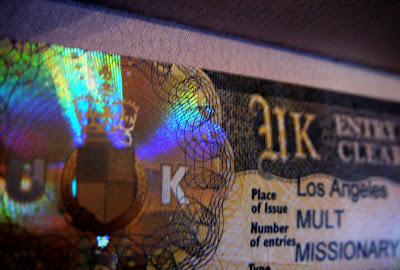 -Getting my passport with the missionary visa in it in the mail today! Getting my visa approved required a great deal of work from a lot of great people, and so it's wonderful to actually have it in my hand. This is such a huge glimpse of God's grace and God working through every part of my journey of getting ordained and returning to Belfast. -Receiving words of celebration and joy from so many of my friends and family. My Mom was right next to me when I got the email that my visa was approved, and we jumped up and danced in a circle singing "I'm/You're going to Ireland!" because we were so excited. -A lazy, relaxed morning spent shuffling around in my pajamas with a cup of coffee and making eggs with potatoes and toast.